This superb Indian restaurant, now established over 10 years, offers a cuisine encompassing fresh, hot and spicy, medium or mild and rich dishes in cool and bright surroundings. 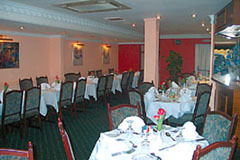 Relax and enjoy house specialities such as a range of Peshwari and Balti dishes, Tandoori, Biryani and vegetarian. Eat as much as you like at the Sunday lunch buffet for only £7.95 (children under 12 only £5.95). Special orders for a variety of Indian foods are welcomed at short notice. Open every day 12-2.30pm and 6-11.30pm (Fri-Sat 6-midnight). All major credit cards accepted. No service charge. Special orders for a variety of Indian foods are welcomed at short notice. Outdoor catering for parties undertaken.